I had planned that my first Before Shabbat of the season would be a breezy, schmoozy, “What I did this summer” report. And it was a wonderful summer, hanging out with friends and family, reading some great books, chillin’ with my grandson, grilling fresh fish and veggies for every dinner, and spending quiet time with my wife. But something happened. Charlottesville happened, and I need to connect with you, my temple family. There have always been people around who hate Jews. There are so-called explanations for their hatred: Jews are the quintessential outsiders who don’t fit in. Jews are cheap. Jews own Hollywood and Wall Street. Jews are rich. And that old stand by, the Jews killed Jesus. These tired old lies have floated around such a long time, some for millennia. We’ve seen how these antisemitic slurs have been effectively used against us over the centuries. We’ve experienced the despair of being singled out, isolated, persecuted, rounded up, and murdered. As American Jews, we’ve seen instances of true antisemitism. Quotas kept Jews out of universities and grad schools and hospitals. We’ve been discriminated against by country clubs and real estate developers. We have felt the sting of prejudice in a million little cuts. Today, American Jews are prosperous and exceptionally successful. We are, in a word, everywhere. Sure there are places where Jews may not be comfortable or where management keeps a lid on too many Jewish hires. But our presence in every aspect of American political, cultural, and economic life speaks to our extraordinary perseverance. It also assures us a kind of safety that we’ve never known in our long history. It is precisely our success and acceptance in this great country that makes the events at Charlottesville so troublesome and heartbreaking. I’ve seen neo-Nazis over the years, their pathetic strutting and ‘seig-heiling’ so reminiscent of dull, unwashed school yard bullies. Then there’s the KKK in their bizarre superhero capes and hoods, screaming about white superiority while proving how not superior they are just by standing there… No, I don’t much worry about these sad, powerless people and their limited understanding of the world. 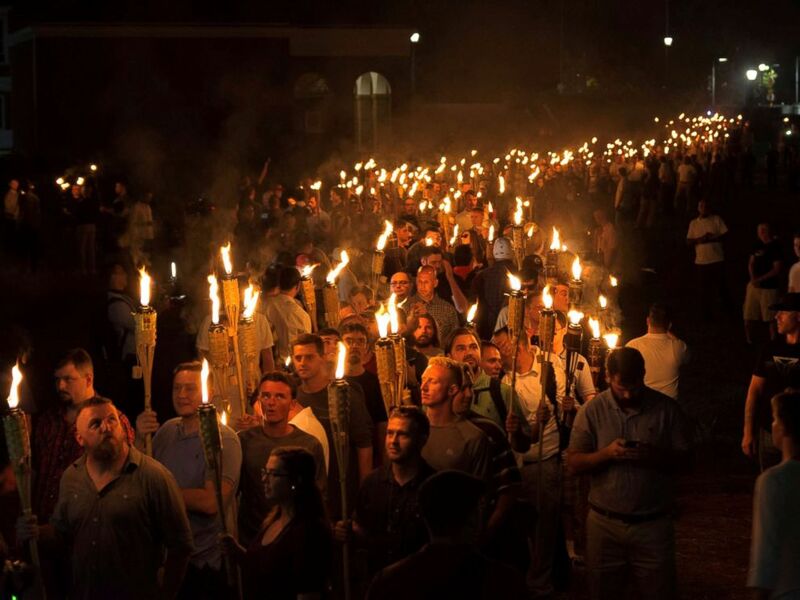 What did give me pause was the candlelight vigil and the alt-right white boys marching through the University of Virginia campus in their polo shirts and khakis. This is a new look of hatred. These are the people who once believed that their racist ideology was contemptible in American society, that they had to hate quietly. These are the guys who tell Jew jokes at work, but only when the coast is clear. These are the haters who never, in their wildest dreams, believed that they could walk around in public, chanting antisemitic epithets out loud. This is the personification of the despicable rhetoric of hate loosed in the presidential campaign of 2016. What do we do? We stand together. We are resolute. We refuse to allow Jews to be victimized by the alt-right. We remain vigilant not only for own safety but for the safety of minorities who the alt-right also objectifies and threatens. We demand that those charged with our public safety, locally and regionally and nationally, be adequately prepared for the antics of the white supremacists. When they move from the exercise of free speech to hate speech, when they resort to terrorist attacks to kill innocent people, law enforcement must unambiguously crack down on them. We call on our elected officials to speak out, to call Charlottesville exactly what it was: a white supremacist demonstration that gave way to violence. We ask our elected officials to safeguard the rights of innocent men, women, and children, to stand with them, to state that without exception, such behavior is anti-American to its core. We must hold our elected officials accountable for their words and deeds in these times. We cannot look away and pretend that this is nothing but an aberration. It is not an aberration – it is a new form of fascism crawling out from under a heavy rock.We must identify it and chase it to the garbage heap of history. How? By aggressively prosecuting them. By pointing out just how out of synch they are with postmodern Western culture. By proving that we can live in a multi-cultural nation. By not being afraid. Yesterday I went to a gathering at City Hall in Newton. Mayor Setti Warren was there along with Congressman Joe Kennedy. They decried the violence in the streets of Charlottesville. They challenged all of us to see ourselves as responsible for gathering together for reassurance and courage. They reminded all of us that we have to stand strong in the face of insidious hatred. This Friday night, Susan and I will be on the bimah, rallying our congregation. We know that there’s not a lot we can do to change things quickly, if at all. We aren’t naïve. But we understand this much: we need each other. We need to know that we care for and about each other. We stand together in strength. We pray for God’s sheltering presence, and that in God’s presence we gain a true resilience born of experience and action. Let’s gather for peace and empowerment. Shabbat service is at 615pm. PS The events in Spain and Finland remind us just how vulnerable the many are to the few who hate. Our thoughts are with all those who have lost friends or loved ones in this latest paroxysm of outrageous violence. As members of the human race, we are all diminished when the innocent are targetted.